Having come out to my family and begun the transition into Caitlin full-time I felt the need to give A a send off. But what sort of kick-off do you give a male persona you were never fond of that is kicking the bucket? It was this sort of clinched thinking that started my mind rolling thoughts of Freeman and Nicholson striving to complete their *Bucket List* across my mental palate, like a coniseuire of the extravagant and expensive swishing a full-bodied wine across her refined taste buds. The best send off I could give A would be to end on a triumph. To go out in a blaze of light and a hail of gunfire, like Butch Cassidy and the Sundance Kid. Or, as my feminized mind turned to, Thelma and Louise. I’m certain A, in his time, would have balked at this reference and perhaps mustered up a gag or seven, but I couldn’t suppress the bitchy little grin that graced my features as I wondered if A had been more of a Louise then a Thelma. The ‘Rents and I bundled up against the windy, thirty degree Minnesota spring day and piled into the Ford Focus—the gender queer daughter assisting her gimpy father into the front passenger seat as the gas-pedal tramping mother started the engine to idle and warm. My mind wandered to the issue of fitting the three of us and my Smiling Buddha-round grandmother into the car. A used to get a kick out of solving spatial problems, but they just made my mind swim (I seem to have lost a little of my formerly pinpoint accurate sense of space and time). The idea rattled around in my Mr. Sanders stuff and fluff brain and eventually joined up with a memory from a previous visit, a visit in which A attempted to prove his masculinity by eating the John’s Omelet Challenge—five eggs, stuffed with “hashbrowns [sic], ham, bacon, sausage, green peppers, onions, mushrooms, Monterey Jack and cheddar cheese” served with toast, coffee, and a slice of orange. 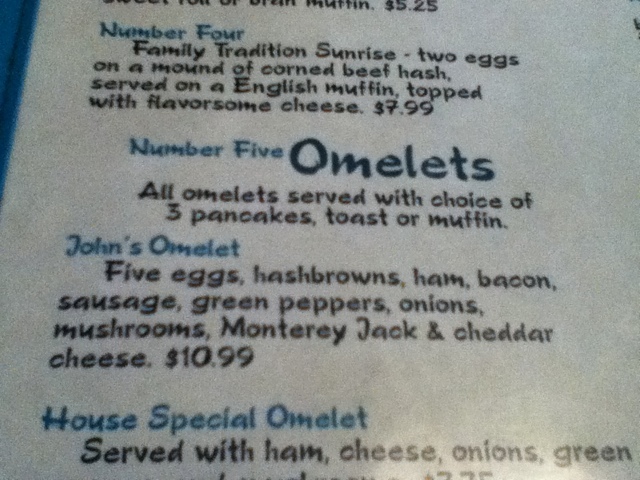 He failed to meet the challenge by a one-egg-sized portion of omelet. This, then, would be his moment. As Grandma does not yet know about Caitlin and the role of grandchild would be played by A, he would get his second strike at the John’s Omelet. It contained the elements of a classic rite of passage: an unusual physical and mental challenge, shame (and a significant profit loss; this omelet is eleven dollars after tax!) connected to failure, and a sense of venal manhood (that’s right, venal; the rite is a type of bribe that gets the boy across the threshold into manhood), and masculine pride put on the line. Brilliant, I thought. This would be A’s blaze of glory, driving himself off the cliff in a Cadillac convertible, I mean, leaping from the cliff-face in a sh-t storm of bullets. 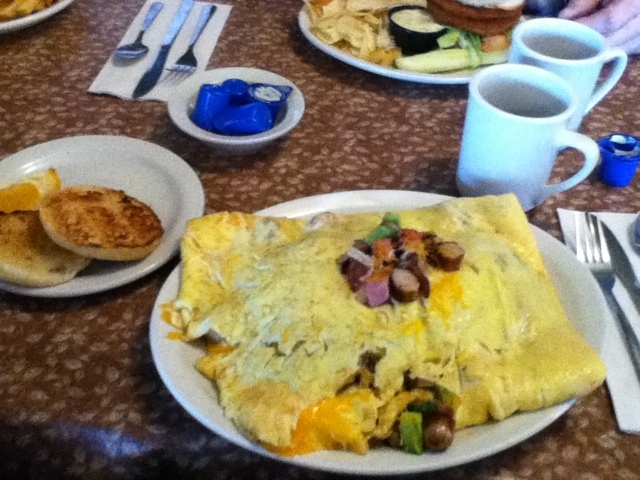 When the waitress placed John’s Omelet on the fake wood grain formica tabletop before us Caitlin balked at the sight of the bigger than her head, five-pound conglomeration of cholesterol, grease, and trans fat, but A simply grinned and dove in. 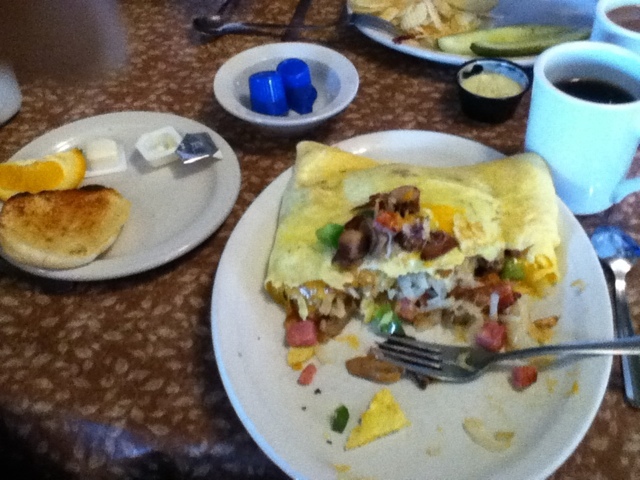 In five minutes he had already eaten half of the omelet and one of the English muffin halves. 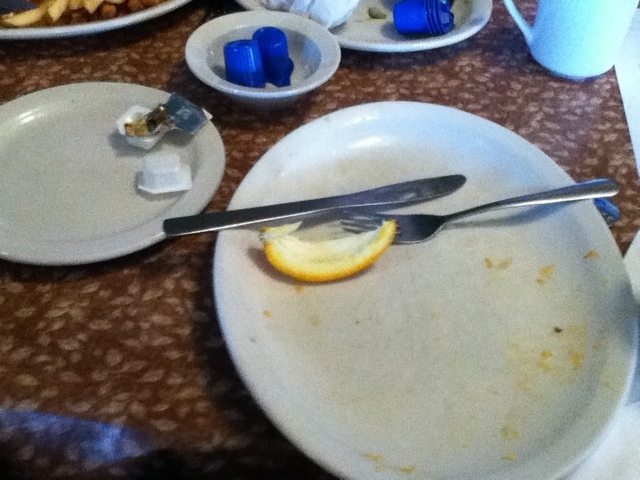 Five minutes later all that remained was a final quarter of omelet. But A was slowing down. The starches from the hash browns were expanding in his stomach and the bland, greasy taste of egg and cheese was becoming monotonous. It looked like this was the end of it for A; a second attempt ending in near success and actual misery. He would not finish the omelet, would not complete the rite, and would never leave. Despite a full, gurgling, vurping, stomach supersaturated with a churning mass of egg, cheese, meat, vegetables, grains, grease, and stomach acid. 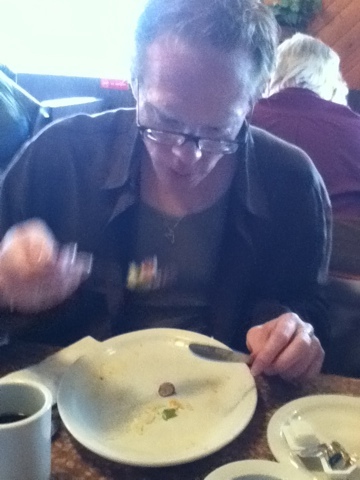 In spite of heartburn, acid reflux, tummy pains, and a build up of gasses, which would become a WGA (Weapon of Gaseous Destruction) unlike any seen heretofore, A continued to eat, bite by bite; mouthful by mouthful; slower and slower but continuing to shovel it in and swallow it down without a return trip until the plate was empty. He did it and faded sated into the back of the mind. Caitlin came forward and has been primary since, even when presenting as A. The cliff is empty and even the dust trailing behind A’s last desperate plunge has settled. And Caitlin? She is content to lay on her bed recovering from the bloating, stomach-distending meal. How like a man to deposit something in a woman’s body and then leave her to deal with the weight gain and pain. Having explained my condition to my family and several close friends I now find myself living at the tail end of an Agatha Christie novel. You know what I mean, that part where you only have two chapters left and Poirot is about to piece everything together and solve the crime and you as the reader begin to make the connections that Poirot as been picking up on this whole time. That part in the book where you think back on everything you have encountered and now all those odd little things begin to make sense, ah, yes! wonderful sense. Those oddities were clues and they are finally coming together in your mind to create a picture of the killer and hir motives. This is the section my life has entered. Now that people know who did it (Caitlin, in the changing room, with the surgical knife) they are finding little quirks and ticks in my behavior incredibly enlightening. These minor mannerism, which seemed mundane before, are now little clues, bits of foreshadowing, and tiny tip-offs to the larger issue that I have come out to them about. For example, I wear a thin silver chain around my neck. Suspended from this chain is a silver, Celtic harp. The harp rests in the cleft where the shoulder bones meet the sternum just above the demarcation for the bust. (The harp was a gift, several years ago, from a girl I dated who was understanding of my condition but who eventually left me for man. Ze bought me this necklace because ze enjoyed seeing me in v-neck and scoop neck shirts and wanted a little something special resting in that cleft, to know that I belonged to hir. Ze was progressive when it came to gender expression but old-fashioned when it came to power and control. I was a fashion accessory owned and displayed with the properly coördinated outfit and not a person loved and cherished. Can you believe I dated hir for three years and accepted hir proposal, agreeing to become hir wife? Although, I would have been a doctor’s wife and the status symbol that would have provided would have been fabulous . . . if only I cared about such things. As it stands, I am no longer a wife and the jewelry I get is from friends who give it because they want me to have something nice. I think it is worth the trade-off to have such friends.) Before the news broke, people thought I wore the necklace because I was a bit eccentric; now, however, they see the necklace as a clue, a bit of the foreshadowing an excellent detective novelist drops in to help the reader figure out “who dunnit.” As my Mom said, “Oh, yes. I remember the harper’s necklace.” You can hear the “Ah-ha!” moment as another clue slides into place and the mysterious puzzle that I am comes a bit clearer. I suppose I am lucky no one in my family and none of my close friends are huge Agatha Christie fans (the ultimate mystery novelist–leagues beyond Sir Arthur Conan Doyle and even better than Edgar Allan Poe) or else they would have figured out who I am long before I was ready to tell them. Just some brilliant observations from Caitlin, the Doctor’s Daughter and Agatha Christie’s almost equally brilliant sister. Who’s afraid of Virginia Wolf? Certainly not the students in Prince George’s county because we don’t have any copies to use in the classroom. I’m to the point where I would buy a copy and photo copy the chapters for the students except we don’t have any paper; not even that horrid salmon color everyone avoids using. But that’s okay because we don’t have the money to pay the teachers either. The scuttle is PGCPS is taking steps to move to a four day week. This will cut costs and free up enough money that administrators and Grand High Pumba Muckie-mucks don’t have to take a pay cut. In the mean time we make do with furloughs and half days. You would think the upside to all this would be not having to worry about teaching or a lack of resources because we aren’t ever in the classrooms to do it. That, Dearest Reader, is too logical a thought. Despite having neither the time nor the resources to teach they expect us to instruct them in everything they would have learned—and instruct them well enough to pass a national standard test that increases the required success percentage annually—had we the resources to function like a well-funded school. Plan ahead. Take responsibility for your situation. Make sure you have all the facts. Lay out a plan. Be aware of expectations and limitations. Know the expectations. Don’t assume anything. These are all tidbits I offer my students. Personal responsibility, I declare. Leave nothing to chance; imitate the Boy Scouts and be prepared. Sage wisdom from the wise professor. But do I follow my advice? Allow my blush of embarrassment and shame to answer that question. After getting off work, I went to look at apartments—two specifically. Just before I left I printed their addresses out to plug into the GPS. Taking 50 and 395, instead of my usual 495 proved as miserable as the 495/66 combination (and I would still need to drive on 66). While sitting in traffic and waiting twenty minutes to go one mile, I thought, Gee, I should probably call them to let them know I’m coming. I really wish I had planned ahead and not made assumptions. Though the office was open until six, they did not do any showings after four-thirty and they did not have any efficiency or one bedroom apartments available. So, still stuck in traffic and not getting anywhere with rapidity, I go to plug the other destination into the GPS only to discover I had not printed both addresses, but the same address twice. So there I sat, waiting to turn needlessly onto 395 and feeling for all the world like a schmuck. And thinking, Hypocrite-teacher you have received your comeuppance. “Remember how we set Grandma‘s funeral arrangements up in advance?” My mother was chatting with me on the phone this afternoon. This was not a typical conversation lead for her but it did not catch me particularly off guard. When it comes to my grandmother nothing catches me off guard. This is a woman who knows everyone at Wal-Mart and who spends equal parts of her time writing letters, having coffee at Hardee’s with her friends, and playing nickel slots at the local Indian casino. So conversations involving Grandma are not startling, regardless of how they start. Now. I have to say, this took me off guard. But what followed was even stranger . . . Pardon me, but you’ve buried someone else’s wife in my Grandmother’s grave and you’re going to try to work out a reimbursement? How about you move the stranger out of the reserved burial plot? Now, I’ve had some hard and unusual things happening to me this past month, but no matter how bizarre and queer my life has gotten, at least I don’t have a strange woman reposing and decomposing in my grave. Today the mighty huntress set out with her sidekick to look for a new apartment for herself and the cat. The results were stunningly lack luster. Our brave heroine knew that the task before her was Herculean. The potential places posited as perfect paled from paradise to purgatory. She left feeling more disheartened and anxious after each stop, afraid that the required home would not materialize in time. Yes, Dearest Reader, these were my emotions as the potential apartments turned into nos. I looked in Greenbelt and Bladensburg but the neighborhoods were not ones a white t-girl would feel safe in. The first one I looked at in Alexandria was nice and the community area was wonderful, however I was looking at a monthly total for rent, utilities, and pet fees of $1123 for FIVE hundred square feet. The last place I checked out today was in Fairfax but it is on the western end of Fairfax, so there would be the whole I-66 issue, but that doesn’t matter because they don’t have anything available. Sigh. The whole day was a bust. Fox Chase: This was a great community but they wanted $1,000 in rent a month, plus I would pay at least $80 a month for utilities and $40 a month for pet rent. Totaling at $1,200. That's the price I pay now for the townhouse and all I'd get is 500 square feet. You are currently browsing the caitlinsong blog archives for April, 2011.